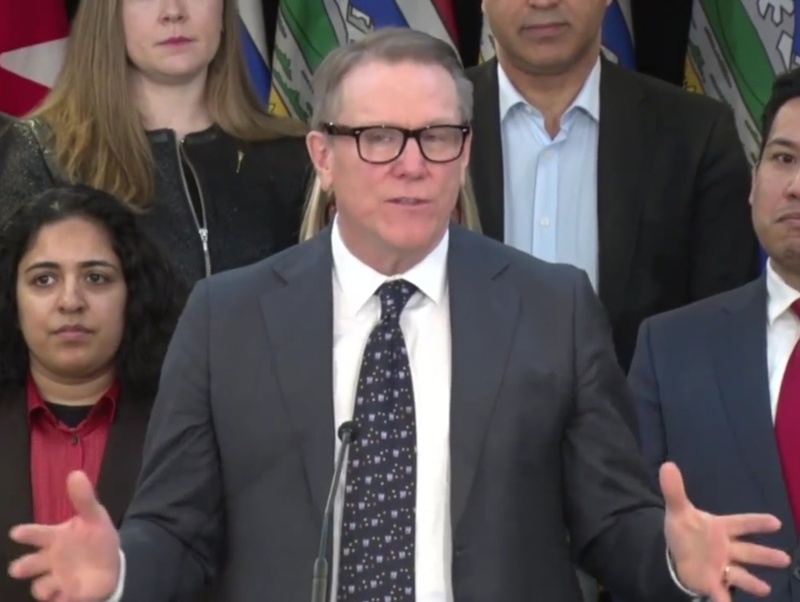 PHOTOS: Alberta Premier Rachel Notley, surrounded by Calgary New Democrat MLAs in this screen shot of yesterday morning’s news conference in Calgary, announces her new government’s new royalty policy, which is pretty much the same as the old government’s old royalty policy. Below: A screen shot of royalty panel chair Dave Mowat at the same event, and a photo of Greek Prime Minister Alexis Tsipras from Wikipedia. To many of the Alberta governing party’s long-time supporters it may seem so tonight. 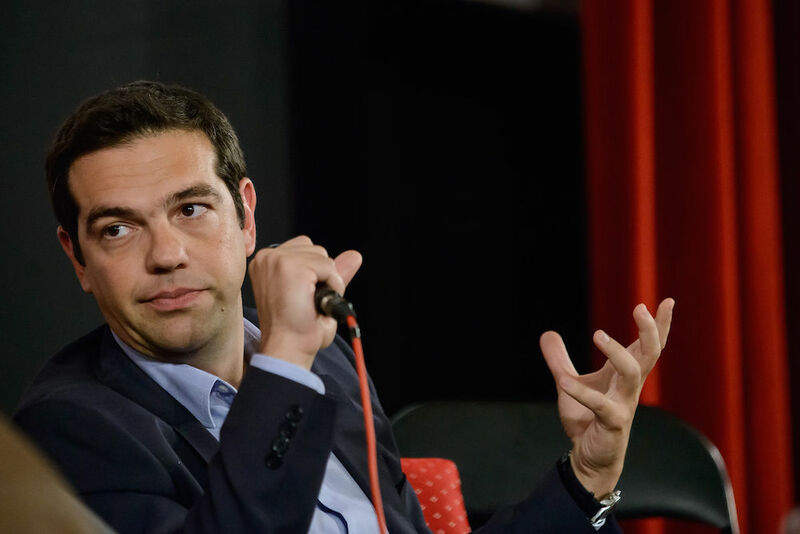 Syriza, as readers will recall, was the leftist coalition led by Alexis Tsipras, elected to govern Greece in January 2015 by vowing to fight Eurozone austerity. Something changed, and in the end Prime Minister Tsipras and his party embraced the European Union’s brutal austerity. The NDP was never all that far to the left, of course, but for as long as anyone can remember it has been an article of faith and party policy among New Democrats that Albertans were not getting their fair share from the petroleum-rich province’s natural resources. Or, as it was so often explained here, Alberta has a revenue problem, not a spending problem. It fell from a peak of more than 41 per cent of sales under Mr. Lougheed to 3.6 per cent today. According to energy policy analyst, consultant, teacher and former government official Barry Rodgers, when all factors are considered this is the lowest royalty rate in the world. It was in large part the wish of many Albertans to return the province’s royalty rates to something like the average 15.5-per-cent return that prevailed under Ralph Klein’s PC government that spurred the broad coalition of left, centre and centre-right voters to elect the NDP on May 5. So yesterday’s announcement by Premier Notley is bound to be a bitter disappointment to many. Notwithstanding the sharp decline of oil prices through the past year and a half, after seven months of study by a four-member panel led by ATB Financial CEO Dave Mowat, the NDP decided to leave the province’s royalty model largely untouched, and indeed to entrench many expensive subsidies to the oil industry first implemented by past PC governments as temporary measures. Well, no one can now say that Ms. Notley is not a pragmatist. The question is, will her pragmatic status quo response to the widely held perception of a need to restructure Alberta’s resource royalties work for her government, or against it? It’s probably too soon to say for sure. Many NDP supporters will continue to believe their party was right last year when it said Albertans weren’t getting a fair deal – and that nothing has changed just because nothing has changed. Still, this need not be politically fatal to the NDP on one condition – that the Notley Government sticks to the rest of its program. That, however, is the sticky part. The political right is right about this much: Without the revenue the government needs to spend the way Albertans demand, something’s gonna give. Yesterday, the NDP gave up on one of two key ways to raise revenue – what has traditionally been seen as a fair return on the resources theoretically owned by us all – not just for now, but for the foreseeable future. So with oil prices where they are now that leaves as the only alternatives deep spending cuts, likely right where the market-fundamentalist parties believe they should be made – to public health care, public education and public service salaries – or running unpopular deficits. Alberta’s NDP understands what’s wrong with cutting spending. They know perfectly well what happens to New Democrat governments that pick fights with the public sector: They lose the next election. Notwithstanding the full-blown campaign against their governments by the corporate-financed right, just such battles were certainly huge part of what happened to Dave Barrett’s one-term NDP government in British Columbia in 1975 and Bob Rae’s one-term NDP government in Ontario in 1995. That’s the real meaning of “Rae Days,” by the way, repeated endlessly by right-wingers around here who don’t know what they’re talking about. They were the days the NDP’s natural constituency reached the conclusion it had been betrayed and took to the streets. So if Alberta’s NDP is slamming the door shut on the revenue side, how is it going to keep it open on the spending side? If the NDP can’t square that circle, and austerity is in Alberta’s future, then the government’s future is problematic. This is a fair estimation of the state and future fate of the NDP government. The royalty regime has always been a giveaway in Alberta and just having a review panel tell us that we are getting a fair return on our resources is rather amusing. I guess if you think giving away the resources is a fair thing to do, then I guess it is fair. But if you think you are getting ripped off, it’s rather a joke to be told that we are actually getting enough. I was disappointed about the lack of change in the royalty regime but I can’t say I was surprised. I am only surprised that I was fooled by these new Tories in NDP suits. I really believed that we got change in Alberta by changing from voting PC to voting NDP but I was wrong. It may even be worse in Alberta now because transparency and information release is even more problematic. I frankly can’t figure out the NDP party. They got Tory voters like myself to vote for the NDP for the first time in my life. I believed they were family friendly. Then they won’t help me with my handicapped sister’s case when she was evicted from the Good Samaritan Extended Care at Millwoods because I talked publicly about the abuse she endured. Instead of reversing the eviction to the long term care facility, the minister of health condoned the downgrading of status of my sister to SL4 which is an unsafe placement for a handicapped woman who is in small subpopulation of folks suffering from a constellation of respiratory problems. It’s pretty mind-boggling. I have gone to Dr. Turner, I have talked to Public Interest Alberta and Friends of Medicare. Nothing has helped. I wonder just what happens to folks when they get to government. Do they forget about families? I am –of course–curious how the family friendly NDP became the family -indifferent NDP. Things are going to get worse. It will be the Klein error all over again. I doubt that the NDP will have any political capital left in Alberta after the next few years are done with. It’s unfortunate that there was a downturn in the economy but the NDP can’t blame their woes on this factor alone. Mr. Trudeau has a downturn in the economy but he has made change happen. So if Team Trudeau can do it-why not Team Notley? What is the difference? I would say it’s keeping promises to the families who voted the political party into power. Mr. Trudeau has kept his promises to families. Ms. Notley has not kept her promises to families. Ms. Notley got a small taste of the power of rural Alberta families. She understands that family matters to Albertans. I only hope that the NDP party as a whole remember their family friendly chatter, the families who supported them and the families who voted for them because if they deny us their representation, I am pretty sure we will be moving on to another political party in the next provincial election. I really like this political party. But I’m not going to vote again for the same old same old. Notley has kept almost all of her promises. Banning corpse and union donations, restoring education funding, stopping healthcare privatization, addressing climate change, raising taxes, and on and on. Trudeau did a few minor symbolic things like “unmuzzeling” scientists and having a gender-balanced cabinet, but that’s it. We’re still waiting for him to keep their promise and withdraw from Iraq. He has broken his promise on the F-35 and the envrionmental review process for Transmountain and Energy East. “…something changed…” you wrote, Dave, regarding the Greek Syriza party. The thing that happened was that they were voted into power and, like Alberta’s NDP, saw the real numbers. Joe Ceci has had many months now to warn his caucus and cabinet colleagues, and his leader. The energy industry royalties, taxes, and their employee’s income taxes pay for an enormous portion of Alberta’s government. Many on the left, and quite a few of us on the right, lament this state of affairs but it is a fact. No wonder they are afraid of sitting in the legislature. What now Miss Notley? My guess is a huge amount of new borrowing is in our future. I’d say the downward spiral of the government plane that is rapidly losing fuel. More debt, more taxes, more bureaucracy. Less services, less supports, no deliverables. Not only will there be borrowing of cash to prop up the present, thereby crippling our children’s futures but there will be a provincial sales tax eventually. There isn’t any other way to pay the bills of a bloated bureaucracy that has no performance that I can see other than the maintenance of an image of good work that is not present. Health alone will be unsustainable with its layers of bureaucracy, no deliverables and expensive high end staff at the top. We cannot continue to pay private sector wages for CEO and others on public sector debt. We need to eliminate AHS and Covenant Health and have these two money pits gone. Alberta Health needs to come out of the la la land of no effective legislation and oversight and do some real work which should be dealing with problems that these two entities do not deal with. The two school board system should go as well; what is the need for the Catholic school board? What indeed is the need for all these school boards that cost us money for nothing? Best to have one superboard for all of Alberta and remove the political training ground of the school boards; why should we pay for training of MLAs like Ms. Hoffman? Why do we pay for superintendents that are all over the place in Alberta? We pay a ton of cash for these folks as well as for the school administration at the blue building in downtown Edmonton. What do all these folks do? Agencies, boards and commissions(ABC) have to be amalgamated or done away with. The ABC expansion and waste of cash is enormous and seems to have been encouraged under the PCs for what reasons I can’t fathom. We don’t need more money pits. We need less of them. MLA salaries, benefits and so on should be downsized. There isn’t enough performance to justify the big bucks. These are not the only messes but let me just concentrate on health and education-our two big debt creators. We can’t stay the same. We will have to change the entire system. This is a fiscal challenge that will rewrite our province because we have no choice. I’m pretty sure this fiscal challenge will continue for a decade or more so we had all better get used to pruning the fat from government that has been exponentially growing for no darn reason that I can see other than to grow. The inefficiencies of the entire system are amazing. And yet we cannot get folks at Alberta Health to do a Protection for Persons in Care report in a timely fashion—after an investigation has been completed in one month! The contrasts are startling. I am beginning to think we need to privatize whole sections of government just to see what they are doing since we cannot get information about what they are doing through asking questions. What does Alberta Health do with my questions for example? I’m afraid that not only will there be borrowing, deficit budgets and a provincial tax but this fiscal stuff is going to be the minor stuff.The failures to deal with human, ethical and policy challenges will be the saddest part of the NDP government’s one term legacy. The NDP government is not doing a good job managing the problems associated with health care and continuing care; they will not be able to do the legislative changes necessary to reform continuing care because they do not have the political will to do this. They have defanged Public Interest Alberta which was the only effective public voice in Alberta by removing Bill Moore-Kilgannon. Mr. Moore-Kilgannon was offered a plum job as chief of staff at Alberta Health where he would have done real advocacy work. Then after the meeting of ticked off citizens like myself with Health Ministry staff last year —we found out that the new health chief of staff had been moved elsewhere. I find this very surprising but the end result is that PIA lost an experienced leader who was replaced by Mr. Joel French. Joel’s a nice guy who I worked with on the Dave Colburn campaign. What is Joel’s experience with the NDP? All the information in red indicates NDP involvement. Joel is a pretty strong NDP supporter. What does this support mean for his role in PIA? This strong involvement with the NDP does not prevent PIA from acting in the public interest but certainly to have lost Bill who was a very effective media wizard is a big blow for the public in Alberta. It depends on Mr. French and the folks at PIA— if they will indeed act in the public interest or simply act as a cheerleader for non-existent performance at government. I mean really Joel-how could the weak Visitor Management Policy be a strong response to banning, evictions, cease and desist letters and actual lawsuits? How does a weak policy address glaring deficits in the Trespass to Premises Act that lacks an appeal process? The lack of an appeal process in this PC initiated hammer on the citizen legislation–allows anyone in continuing care or in the health care system –to force families apart from loved ones in care just by a phone call, a direct request in person or by a letter. Once they ban you then you have no recourse. The eviction has no return. Then yapping about abuse will result in cease and desist letters, lawsuits and major sums of cash on legal fees. I should know as I am being sued for yapping about the confirmed abuses of my handicapped sister on my blog. None of this junk will stop with this weak policy and this placebo policy is simply a way for government to manage the citizens so that bad press does not ensue for AHS, Covenant Health and Alberta Health. We have no protections as citizens with this future policy which will probably be like the ineffective appeal process that it took the Ali family almost a year to get at AHS. This appeal policy is guarded by AHS folks, is internal and won’t provide justice to families in my humble opinion but at least the NDP government can say that they did something which is nothing. We have a ton of other places where citizens can go to but they all have no power. We have no help from the shell organizations that exist that have no power to enforce any yapping they do. The Patient Relations Office at AHS and Covenant Health is designed to protect the image of health care and continuing care in Alberta which is supposed to be fantastic but is actually less than this. So the place where we have to complain to is designed to move families forwards from the problems that need to be reviewed publicly so that change will actually happen. Instead, the goal of these places is to ensure that problems never make it out to Facebook, Twitter and blogs. The Ombudsman Office can’t do anything more than say you have been treated unfairly, the Health Advocates Office will direct you but not advocate for you and the folks at the PPIC place are overwhelmed with work, can’t enforce anything because the PPIC legislation is limited and cannot prevent you from getting sued if your loved one is outside the facility. It’s a big bowl of 44 years of entitlement, failures to help citizens and sham democratic representation. But really what could we do as citizens? We were all so afraid to speak just in case the big boots come down on our powerless selves or families. Under the Tories, it was the Tory way or the highway. Now under the NDP it is the NDP way or the highway. But in the case of the NDP they appear to be more of the NDP party way or the highway since they are more concerned about the political party’s survival than anything else. The NDP are more strategic than the Tories and they were smart enough to remove any public opposition like Mr. Moore-Kilgannon and then neutralize his contribution in the public arena. Yup Mr. Moore-Kilgannon would have done a fine job yapping about the Ali family right now but he’s been neutralized unfortunately. In addition to the loss of Bill Moore-Kilgannon who has been basically placed in a non-vocal position for health / continuing care issues and for citizens like our family–we have the funny stability mantra of the current Health Minister who has not provided remedy to families whose family members have suffered abuses that are validated by the Health Ministry itself. So what does all of this indicate to families who voted NDP? Better pull your socks up, tie your shoes and start running for the opposition parties. Our kids are going to be paying the bills of fat ineffective government. And our current family members in continuing care will have to be written about on blogs, Facebook and Twitter because we do not have the leaders in the public arena like Bill Moore-Kilgannon to get the word out to the public that the government is not working in the public interest but is certainly working in the interests of business as usual in Alberta. 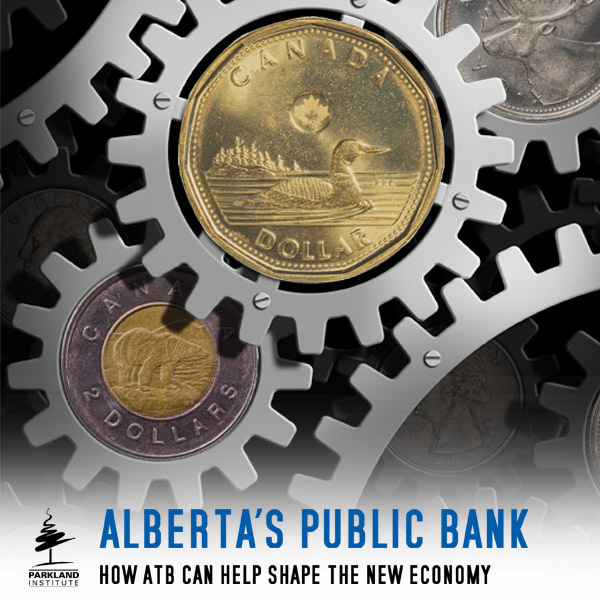 Money does not fall from the sky in Alberta but sure as the stability mantra is sung at Alberta Health–we will have our pockets picked, our children put into further debt and bureaucracy expanded at the expense of common sense, deliverables and democracy. I have to quibble with you, Chris, regarding Greece. They did not see the “real numbers” and then change their tune. Rather, they were outright threatened by Germany and the EU to continue with massive austerity. As an aside, the whole Greek crisis has little to do with Greece, but rather is a way for the ECB to bail out private European banks who made risky debts in Greece, Portugal, and other peripheral EU economies before the 2008 crash and now wants the taxpayers of Greece (and Europe) to bail them out. There is an interesting article in Foreign Affairs by Mark Blyth discussing this issue, if you are interested (https://www.foreignaffairs.com/articles/greece/2015-07-07/pain-athens). Thanks for the link. You still can’t square the Greek circle of spending beyond their means and not properly collecting their taxes (have you read about all the Greek surgeons with personal swimming pools claiming salaries of $11,000 per year on their tax returns, facilitated by the widespread bribing of tax collectors). A modern democratic nation cannot provide free post-secondary education to age 30 and full pensions at age 55, no matter how nice that sounds. Attention shoppers: Corporate neoliberalism, with that secret religious sauce, is on sale today. It will be on sale every day for the foreseeable future. In fact, it’s the only item we sell. If you wish to purchase a different vision about the way things should be, well then, too bad for you. Clean-up in aisle three. Perhaps it’s a small consolation, but you can bet that if the Wildrose Party had won the election they would have immediately LOWERED the royalty rate rather than left it where it was and their rationale would have been the same as for lowering corporate taxes: the economy is suffering and we have to help out the industry. So leaving the rates where they were was a kind of victory when you consider the alternative. Ignore ideology, and do what is rational – institute a provincial sales tax. Legalize marijuana, and tax it. That’s the easiest way to raise money and diversify the economy. If not, then at least stop prosecuting and save money on the enforcement side. If they can’t raise royalties, then at least stop subsidizing the oil and gas industry. Lastly, chase down all those rich deadbeat ranchers and farmers who owe the Alberta government back taxes and rent for their leased land. While their at it they could try and collect all the tax money owed to them by businesses that are in arrears too. Sell, all the golf courses the government owns. With our low dollar it should be no problem finding rich foreign buyers. So, Big Oil gets the long-term peace of mind it denies everyone else. There is one ray of hope, though. The ‘new’ royalty system’s talk of transparency and simplicity might sound like the usual political boiler-plate, but when applied to accounting practices–maybe not so much. For years we’ve heard of royalties going uncollected. Perhaps that’s going to change. We can hope! How true is it that nothing has changed? For example, suppose world prices were to return to the levels seen in dimly recalled prehistoric times of 1 entire year ago, let alone two? Would the Province receive more, less or the same amount of money per unit of production as under the previous royalty regime? I can’t make out what is the answer to this from the summaries I have read so far. This is it for Alberta’s NDP; they’re done like dinner. There is absolutely no reason to support a party that says one thing and does another. And they have no ‘known’ acumen or competence in economic affairs. It’s always been the case with the ‘left’; they are populated with intellectuals with no real expertise and no balls or backbone to actually do anything. Thet all believe in milk and cookies and warm fuzzy relations. It’s too bad. We really had a chance to do something good in the province. oh yeah! … one last thing … shut up Chris! Ok, suppose you are right. If not the NDP for Alberta then who? subsidies for corporations; un-regulated free-for-all for industry; policies that ensure the wealthy get theirs before anyone else … then choose the WRP, the PC’s or the NDP depending on just how wild a ride you can take. social democracy; regulated and managed development of provincial resources; safe and livable communities … yer outta luck bud! The difference with wild ranting ideology before being in power and actually being in power is just a simple thing called reality. I’m glad that Notley realized her last ideologies were crazy. Braid: After years of bashing royalty system, Notley’s OK with it. And she’s right. The road to reality can be embarrassing in politics, as Premier Rachel Notley must have realized Friday when she admitted that Albertans are getting a proper share of oil and gas royalties. 100k people have lost their jobs. Exactly zero public service employees have lost their jobs. The next shoe to drop is reality that austerity is required. Get ready. Yeah, I see the red herring of public sector employees a lot these days in the right-wing press. Of course, what’s left unsaid is that the oil and gas sector workers made way more money than public sector employees – those that did not save their money are now blaming those who chose more secure jobs with less pay (and don’t tell me the oil sector pays less than the public sector in Alberta – we, here, all know that is not true). This “Chris” not the same “Chris” as in the second comment from the top. Wow, I didn’t have high expectations for Notley’s government but I did expect them to follow through on stances they’ve held for years. This royalty review is even less impressive than the Stelmach one (and isn’t that a depressing thing to realize?). I admit when I saw who was sitting on the NDP review panel I was concerned but decided to give them the benefit of the doubt. They failed. The NDP failed. With the exception of the health and environment ministers the NDP has failed miserably at every turn, done sweet nothing for its supports, and been spending most of its time trying to make the Wildrose and Ezra Levant like them. It’s a party that’s showing no backbone and no ability to do what it was elected to do. Albertans didn’t vote for the conservatives in an orange coat but that seems to be what they’ve gotten. I’m very disappointed. It’s even worse when you compare Notley’s performance to the Trudeau Liberals. Where has the Alberta NDP “failed.” They’ve kept almost all of their promises despite an economy in crisis. I don’t understand this idea that Trudeau has kept all his promises. Besides the symbols stuff like “unmuzzeling” scientists, he’s broken almost every major promise. Look at the F-35, the Iraq bombing, pipeline reviews, and refugees. Ms. Notley has not done anything in continuing care. 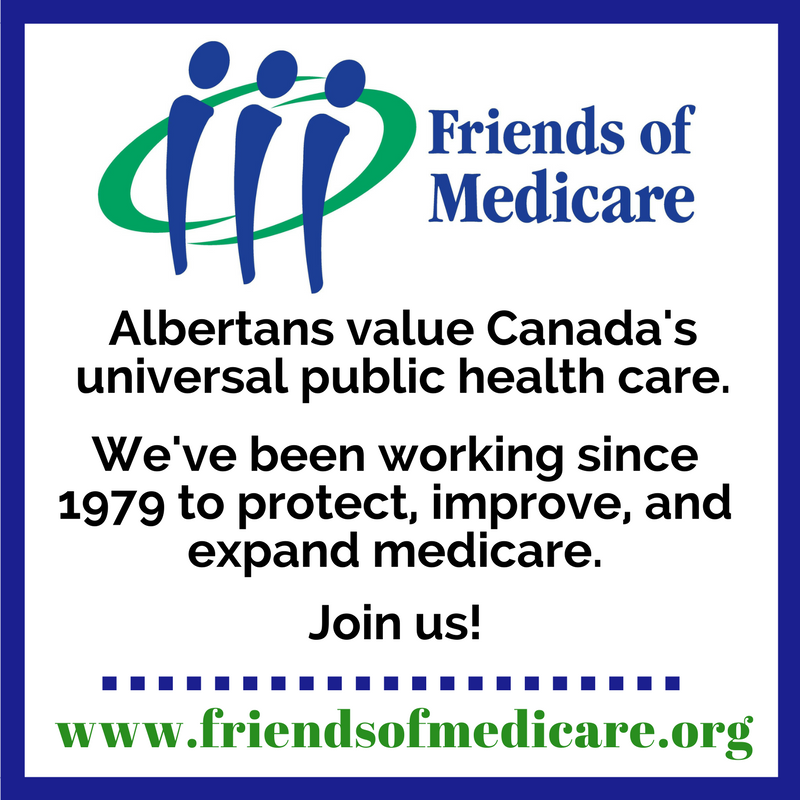 The problems in continuing care are well known to the NDP folks as Public Interest Alberta and Friends of Medicare are in close relationship with the NDP and present information to the minister of health as do other citizens such as my family. There is a need for an appeal mechanism in the Trespass to Premises legislation that would ameliorate the adverse use of this legislation to silence critics and advocates who express the facts about the abuse of their family members to the public. This fixing of the Trespass to Premises Act would have been easy to do; instead of this Ms. Hoffman opted for a weak Visitor Management Policy at AHS which, like the appeals policy by AHS that took months to develop despite legislation mandating it–won’t solve the problems of retribution for public advocacy work. There is no whistleblower protections for families who publicly raise awareness of the problems in care that impact a population of vulnerable at risk folks as was the case at the Good Samaritan Extended care at Millwoods where respiratory patients were without respiratory therapist shifts for over a year, lacked proper oversight of respiratory care and did not have updated integrated respiratory care plans. These failings were confirmed by the CCHSS Audit by Alberta Health conducted in January 2015; a further quality audit was done in October 2015; AHS was supposed to do a respiratory review as per my request. The failures in oversight at this facility are astonishing. What was AHS doing? Why did families have to find these issues? My family is not the only family that complained. How many Protection for Persons in Care complaints have there been at this facility over say the last 5-10 years and what sort of action has the ministry of health taken? What about the problems in staffing? When was the staff trained to turn on the BiPAP machine for my sister? I’d say it was after two adverse events where no sort of training appears to have happened. Safety checks are not the same thing as training staff on equipment. Ms. Notley is responsible for the operations of ministries. If the Minister of Health and seniors cannot ensure safety then I guess families have to do this work by indicating to the public the safety issues in continuing care facilities. Furthermore if the Minister of Health allows further problems by allowing the downgrade of my sister Rebecca to a SL4 site that is unsafe for her complex needs then this is a further indication of the failure of the NDP government to evolve the systems in place. Ms. Notley has failed vulnerable citizens like my sister Rebecca. Continuing care is not the only area where Ms. Notley has failed. The royalty review was an expensive waste of money for no change. We have the same sort of PC strategy of getting a panel of “experts” to tell government what to do when we feel as citizens government should know what to do and probably in this case, government did not want to increase the royalty rate but did not want to get the flack directly from citizens about this cowardice in policy position. So my feeling is-and I may be wrong, is that in order to do the expedient thing, the Notley crew got us to pay for a panel that said the decision that was already a done deal and everyone is happy that the royalty rate is not going up. Was this good for citizens? I don’t believe so. It was good for the oil and gas industry which gets special treatment in a bust but it was not a good decision for citizens. Why is the oil and gas industry getting special treatment when most of the major players have major assets to tide them over and can afford an increase in royalty rates? Why is the industry off the hook always? I would say because Albertans are brainwashed. The industry makes a ton of profit and in a bust it still makes profits. The jobs lost in a bust are part of the way the industry ensures profits are made. 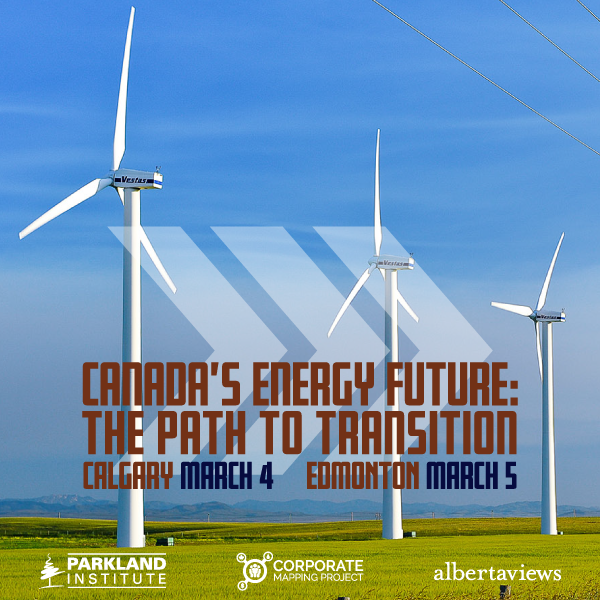 It would be useful to increase the royalty rates, have the oil and gas industry pay more and see if the industry runs off and leaves their major investments in Alberta. I somehow doubt that these companies with billions of dollars in assets, will leave no matter what. If they did leave, then I guess the oil would have to stay in the ground for our grandkids and we could develop other areas of our society. Such a vanishing of the oil and gas industry might even be good for our society that is wasting a ton of cash on luxuries such as the major salaries of executive staff at AHS, Covenant Health, universities, ABCs (agencies, boards, commissions), school superintendents, a public and Catholic school board system that should be one board and so on and so forth. The amount of money wasted on these entities is major and could go elsewhere. Ms. Notley is a nice lady but she is like all politicians interested in keeping power rather than helping citizens. I imagine she will be replaced in the next election. Why would we vote again for the NDP when we aren’t getting help for our families? The role of government is to provide the legislation that serves citizens; in the case of continuing care this revamping of legislation is long overdue and I do not see this evolution happening under Ms. Notley’s watch. While you may be right that Team Trudeau has not kept some of his promises, just look at his approach to the public. It is open and transparent. That counts. In contrast, there is a cone of silence over ministries, some MLAs are not available to the constituents and despite all our communication with the MLAs we do meet, our concerns are not resolved appropriately. For example, my sister Rebecca was downgraded from long term care to SL4, will be dumped out of the Grey Nuns Hospital with the full approval of AHS, Covenant Health and Alberta Health. The SL4 site is not appropriate for her complex respiratory needs. But no one cares; families are still moved forwards. The NDP government is no different than the PC government. In politics I guess nothing changes ultimately; only the citizens become informed. I’m not sure if that tag is used anywhere besides summer camp, but my brain automatically plays it when I hear the first part of the phrase. Consensus seems to be forming that the NDP will govern for a single term, maybe. Yet there’s hope. The Notley Crew should bite the bullet and do Alberta’s finances a favour by instituting a sales tax. The rest of Canada suffers through it without terminal pain. The sun will still rise over the Saskatchewan border, service cuts, if needed, will obviously be less. In the long haul your revenue base will be more stabilized and balanced. To take chunks out of Alberta’s excellent health system and social safety net would be a shame. In over three years in Calgary, I was impressed with both. Don’t let the NDP go to war with the people who provide such top notch services. Everyone loses except the usual suspects. Not sure where this obsession with a sales tax comes from. It’s only the next best thing if you’re a consevative which is certainly what the Notley gov’t is acting like. The real solution is to raise income taxes, say to about 30%. If handing over the ‘common’ wealth in the provinces natural resources to a few corporations owned by foreign shareholders is all about saving jobs (a half million by some commenters on this site) then lets have all those workers paying a share for the “top notch services”. That’s the whole point of this exercise. As a formerly high-paid oil worker I was paying large amounts of Alberta income tax. I would be paying even more now with the higher rate if I hadn’t been UNEMPLOYED FOR THE PAST 8 MONTHS. You can’t tax income if there is none, so jacking up royalties and killing off more of the industry would really not help anyone, would it. This “consensus” is mostly the endlessly repeated assertions of the embittered losers, who interpret any event, no matter what, as affirmation that they was robbed (robber, I tells ya) and that the next election is sure to restore the universe to its natural axis, revolving around certain factions of rural Alberta and the invisible oil barons of Calgary. And those are the reasonable ones. The crazies think that the shear force of their hysteria will force Notley and Co to resign forthwith, and then commit ritual suicide on the steps of the leg. After which event, everyone will go right back to old Fort Mac. I can understand the many problems faced by a new government that Albertans have such high hopes for. Once again, it seems that the NDP has failed to communicate to those same Albertans, a long-range policy for a royalty plan that works for all. I am pretty naïve, I guess, but someone needs to explain to me why a fluctuating royalty rate would not work. Let’s set the rate at 20%, for example. When Alberta crude is selling for $40, then the government would get $8 per barrel. When, and if, the price for crude gets back up to $100, the people of Alberta, ie. the government, would receive $20 per barrel. Would this not solve a lot of problems. We don’t hit the industry too hard when it is suffering, and we benefit as the industry regains its health. Can someone tell me why this would not work? There must be a reason why the brightest minds in the old PC government would have rejected such a simple approach. Sure a sales tax works, but it is immoral and no amount of tinkering can make it better for lower income people. Progressive corporate and personal taxes along with a progressive royalty set up is all that is necessary. The oil people threw Stelmach out of power, and the people of Alberta responded by electing Notley. But apparently we have just seen a corporate takeover at (literal) gun point thanks to the Freemen on the Land wildrosies aided by the gutless NDP. Think of it: Stelmach as more progressive than Notley Things are just going to get uglier now. In politics like in life, whether some like it or not timing can be everything. It obviously was not the time to raise royalties when oil prices have fallen so much and oil companies are laying off thousands. If the government did that they would have got blamed even more than they are now for the economic problems Alberta faces. The opposition parties would be calling it NEP II and we know who well NEP1 worked for the electoral success of the Liberals in Alberta. About the mythology of Lougheed, aka St. Peter and royalties – I am sure he was a great man, but he didn’t walk on water. One of his smartest moves was to know when to leave and that was when the economy started to turn sour. He also raised royalties when oil prices were going up, not going down. Good timing on his part in both situations. What this royalty review means is that royalties will not increase right now. Does it also mean it is guaranteed they will never change? No, I don’t think so. That was the good stuff that the Tories sold off cheap to enrich their cronies. Now we are fracking and digging up bitumen, expensive processes that need high prices to break even. That’s why we can’t charge much royalties. Well now who do I vote for in the provincial elections? I always thought oil royalties were a percentage of the saleprice of a barrel of crude. Or is it a fixed price per barrel? Can someone who knows answer this? It may just be that the no change in royalty is going to stay only while crude is down but maybe will bechanged if crude goes up. We don’t know at this time. Who do you vote for, Jim? What are your real options? Do you want to bring back the Tories who rejected a corporate tax increase and anything but the tiniest increase of taxes on the wealthy? They were planning a 15 percent cut in government programs over a 10-year period, opposed a carbon tax, and supported a return to medicare premiums. When the province had real bargaining power with Big Oil, that is when oil prices were high, they handed over the store. Then there’s Wildrose, who are worse than the Tories in terms of love of privatization and cuts. Plus their leaders and outspoken members are batshit crazy. The NDP are a pro-capitalist party like the other two as they proved again on Friday but they do support health, education, and social services. While the economy is down, they recognize that we still need the services that we had when the economy was up. And when the economy takes off again, they will likely be a lot bolder than they can be at the moment. And no, I didn’t mention the Alberta Party, which is really a Tory party in disguise, or the provincial Liberals, who opposed a royalty review but in most respects are ideological twins of the NDP. The major difference is that the provincial NDP is a living party whereas the provincial Liberals are dead and should be left for dead to prevent a return to the unnecessary splits on the left that always guaranteed us a right-wing government before 2015. * instituting a sliding royalty rate, at the very least to capture some share of the price spikes we are likely to see as decline rates accelerate and plunging exploration capital expenditures turn a temporary glut (plausibly gamed into large price falls through massive shorts in oil futures) into (highly profitable) shortages. Absolutely necessary for Notley to seek out a broader advisory base. Am curious to hear what Stelmach’s former royalty review team i.e. Evan Crapko et al have to say regarding this most recent development. Is it possible that a new royalty rate structure will be unilaterally invoked upon return to higher world prices? What can only hope! David, I don’t understand how you can argue that raising royalties is a solution to Alberta’s current fiscal problem. While I may disagree with the proposal of the review panel, I will admit raising royalties right now would be disastrous. McGowan agrees with this point, too. Royalties were never a short-term solution, so your argument that they could have dealt with the current budget problem is a false one.